The Venus flytrap plant is a carnivorous plant, native to subtropical wetlands in America. In England it is commonly sold as a house plant, but people find it difficult to look after. Here are some tips for keeping it alive. Waiting for its prey to land! I keep this one on a sunny windowsill and it sits in a saucer of rainwater. It does not like tap water. It never seems to catch a fly, so I give it a helping hand by catching one and feeding it. The trick is to trigger the leaf to shut by brushing the insect against the trigger hairs. It will not shut until at least two hairs have been triggered. 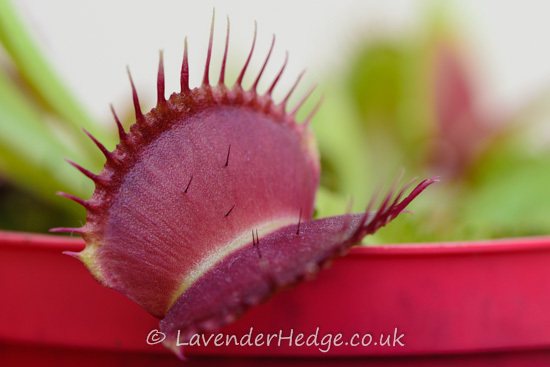 Children are fascinated by this plant, but do not let them tease the plant into thinking it has caught a fly by poking it, or feeding it some of their beefburger – if they do this too often it will die. It will die back in the winter and as the leaves go black, I remove them. I then keep it watered, but don’t let it sit in water. You can purchase a Venus fly trap here. When it needs repotting, use a special carnivorous potting compost.